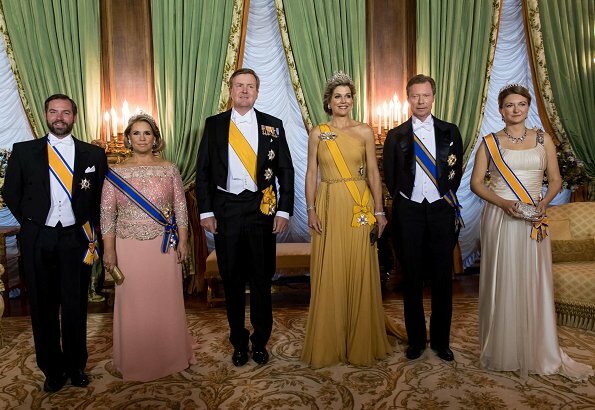 On the first day of Luxembourg state visit of the King and the Queen of the Netherlands, Grand Duke Henri and Grand Duchess Maria Teresa held a state banquet at the Grand Ducal Palace in honour of King Willem-Alexander and Queen Máxima. 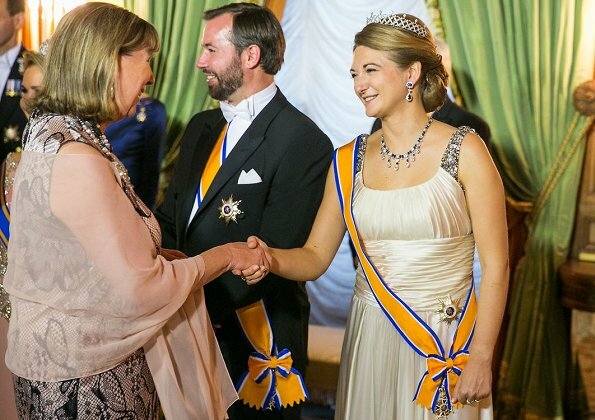 Hereditary Grand Duchess Stéphanie and Hereditary Grand Duke Guillaume also attended the state banquet. 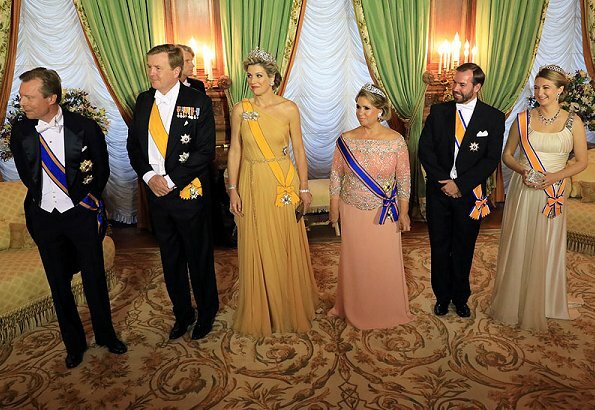 King Willem-Alexander and Queen Máxima are making a state visit to Luxembourg upon the invitation of the Grand Duke and the Grand Duchess. 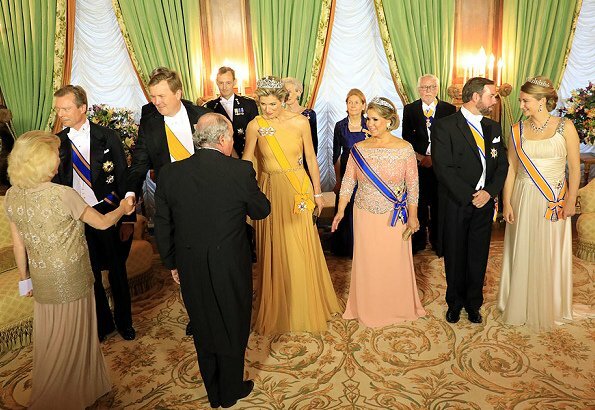 All three ladies look wonderful - Maxima is stunning in the soft pleated flow of her grecian-look dress, Maria Teresa regal in her pink crystal encrusted outfit (very nice neck line) and Stephanie elegant in champagne, and with a very nice coiffure that suits her and shows off her tiara very well. It's quite surprising but all the ladies dress colours go very well when they are standing together. Well done! Stephanie is wearing a 2008 Elie Saab that belonged to MT and it looks like it is from 10 yrs ago. Overall it is not too bad.I wish she would buy her own clothes versus raiding her Mother in Laws basement closet..
MT is also wearing Elie Saab~ gorgeous! Diane, Stephanie’s dress is lovely. There is no problem with borrowing dresses. They should be worn more than once. Is it really possible that Stéphanie wears a gown which fitted once MT? The difference in size is considerable. Did I say there was anything WRONG? No! My thoughts are that she ONLY wears MTs clothes these days. That is why she is always looking dowdy. She is young woman. She and MT have totally different bodies. Trying to tailor for that extreme in top of clothess decades old does not usually end well. I did say overall she looks fine. I am just stymied by her continual use of borrowed clothes. As many of us are. Yes Anon ~ google and you will see MTZ in the dress in 2008. Just a smaller setting of the Stuart tiara and it is breathtaking. Wow - the Stuart tiara! but without its HUGE Stuart diamond.. when will we see that I wonder? This dress of Maxima is flawless perfection. Stunning! Stephanie looks beautiful. The dress is modern and chic. Love the jeweled straps!! Máxima looks stunning, that color is not an easy one, but WOW!! !, perfect silhouette, and that is how you wear the order, not touching the skin, and perfectly pinned and balanced. I find MT's dress a little too ornate and old fashioned, but the color is flattering and she manages to look very pretty. Stephanie's is a big NO for me, the draped bodice, makes her torso look short and thick, and makes her appearance very matronly, she is so young and pretty, I wish she would just be a little more adventurous. I always have a feeling that Stephanie is just thrown into the situation, never looks fully engaged, it almost looks like she feels akward. I don't know maybe she has low self confidence that's why. But I could be totally wrong, I don't know just a feeling. I don't think she has low self confidence, but I think she might be introvert and simply does not feel comfortable being photografed in such a glamorous setting. Anyway I think she is an intelligent and friendly young woman, someone you'd like to meet. You're probably right, no doubts she is friendly and intelligent. 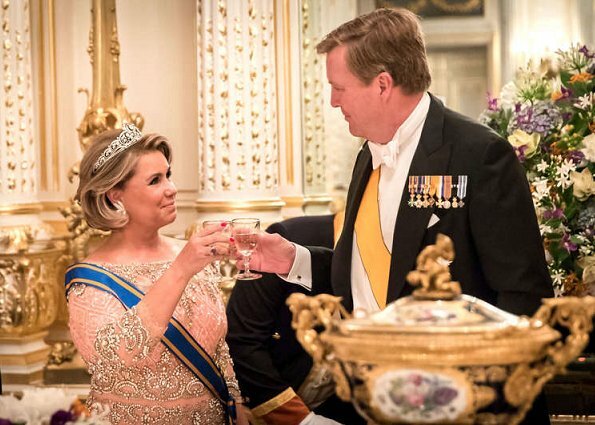 H.M. Koningin Juliana's favoriete diadeem, ontdaan van de grootste stenen! 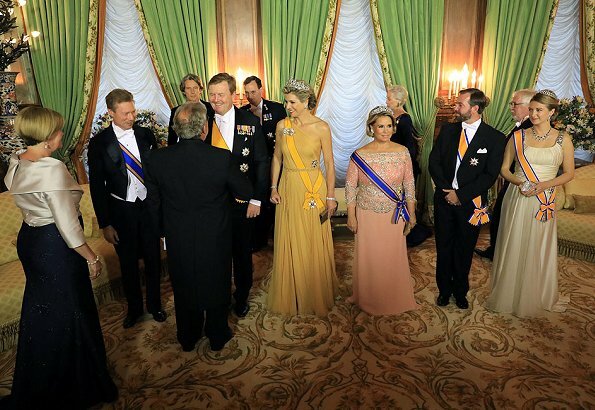 Hum... Lovely dress on Maxima, lovely dress on Maria-Theresa! 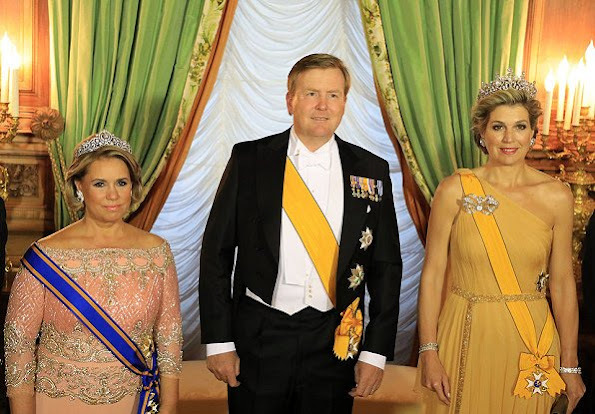 And that brooch on Maxima, I am surprised it does not rip the fabric, it must be heavy! Wow! Stephanie's dress is nice, but there is something about the draping at the waist and the bust that disturbs me. Nice jewels and hairdo though! I like dress, but it seems a bit too big around her waist. The hairdo and jewels are very nice and she looks so sweet. If the dress had been a little bit more firm around her waist it would have been perfect. Extra draping was added to the middle so the gown would be the proper length. I think I t looks so much better before the modifications. 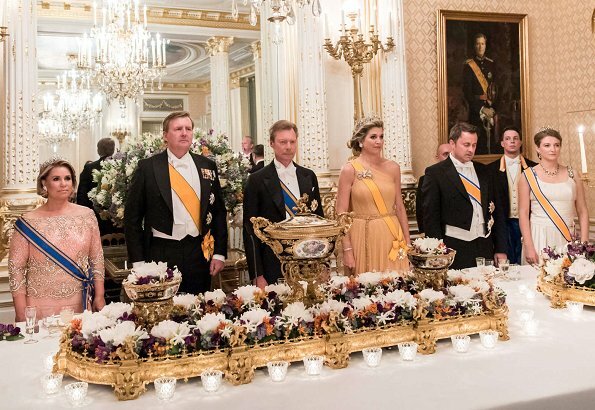 Nobody does the gala and state banquet theatre better than Maxima. This one also: 100% perfect! I can't understand why Stephanie keeps the bag like that! It does not look good. 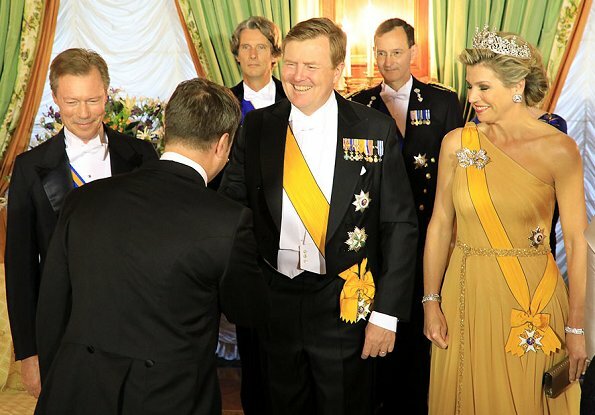 Ik had iets minder fel moeten reageren: twee grote diamanten zijn veranderd in oorbellen; en van de devant corsage is veranderd in een broche: 15 edelstenen zijn zoek! 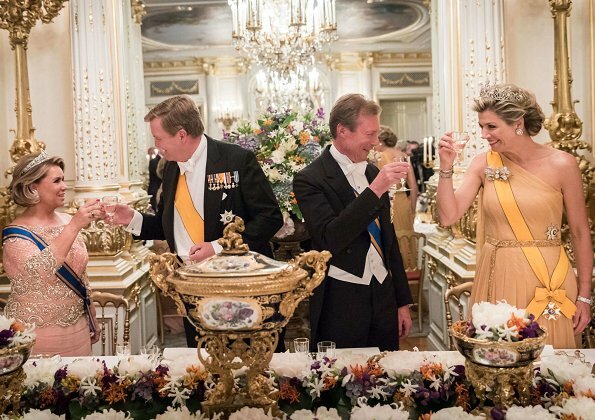 Zo ga je niet om met de erfenis van H.M. Koningin Juliana. Queen Maximas outfit is stunning. Simple and ultra elegant robes likes this need a fitting. She must have had one, because it fits her simply perfect. The colour is the best canvas for that tiara and the other regal jewelleries. Her hair is wonderful too. GD Maria-Theresa knows, what is best for her figure, complexion and age. The King and Grand Duke look very good too. 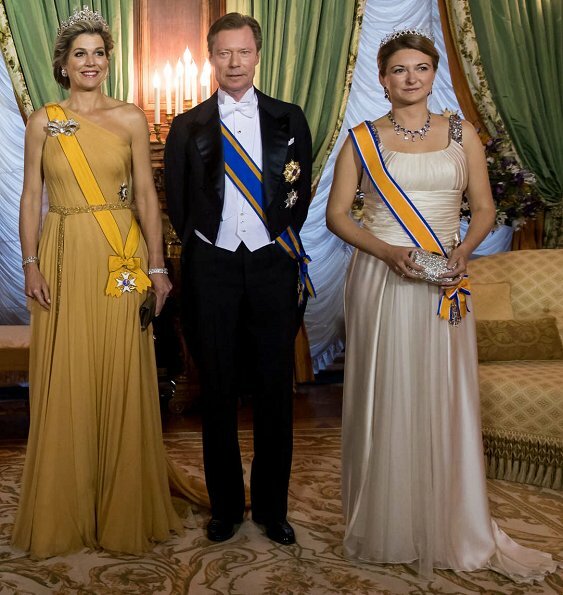 Is t6his the dress Queen Maxima wore for her 40th birthday concert? Beautiful Gala dresses and jewelry on the Ladies,the men look very good to. Maxima looks perfect, so good to see Stuart Tiara! She really knows how to play diamond game big. 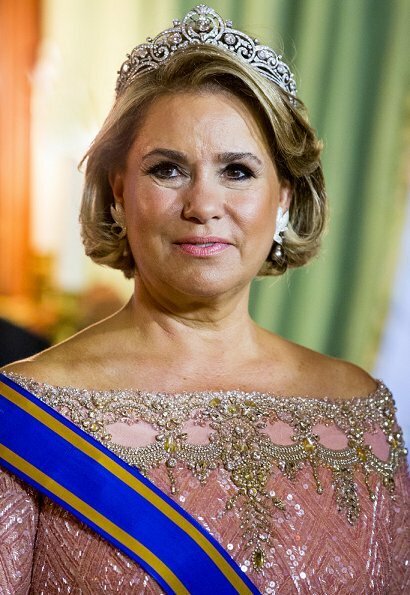 Love Maria Theresa´s dress and jewels, but her make up is too heavy. 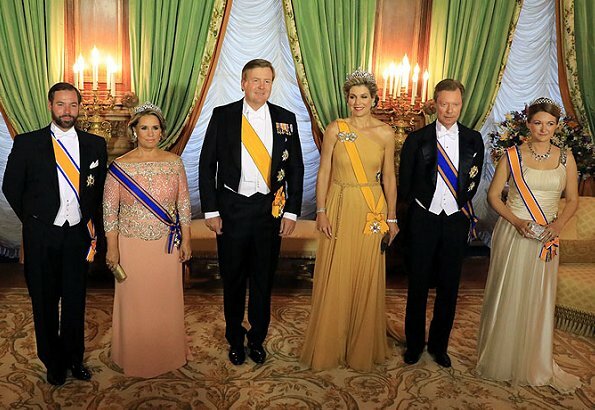 I also like Stephanie´s dress, but her up-doe and tiara together make nothing good to her. This tiara would need to have a high up-doe or something to lift the image, now the overall look n somehow flops. all the ladys are most beautiful. I can't say any of the gowns grab me. Maxima's is probably the nicest, it looks like the gown from her 40th, but altered. I do love Maxima's jewellery, a very, very nice selection.